7. How To Play "Sweet Home Chicago"
9. How To Play "Big Boss Man"
10. How To Play "Bright Lights, Big City"
Learn everything you need to play 100s of your favorite blues & rock songs! The shuffle rhythm is the heartbeat of American music. It's the keystone of country music's "boom chuck" rhythm, the basis of swing in jazz and provides rock & roll with it's energy and drive. A guitarist that can't play an authentic and natural sounding shuffle rhythm just plain can't play the blues! The Art of the Rock Shuffle breaks down the "swung" or blues shuffle into it's essential elements and presents them in 6 clear, step-by-step lessons. This is the tough and swaggering sounding rhythm guitar groove heard in the playing of the legendary Missississippi Delta and Chicago Blues players like Robert Johnson and Jimmy Reed. Along the way you'll learn right hand techniques, turnarounds, intros and outros and much more, including how to play the classic 12 bar blues tune Sweet Home Chicago by Robert Johnson. However, with the tools and techniques taught here you will be able to play 100s, even 1000s, of your favorite blues and rock tunes! A bonus lesson reveals how the same 12 bar form and changes can be used to play Jimmy Reed's Big Boss Man and Bright Lights, Big City using the same techniques. Beginning guitarists will find these lessons accessible, easy and acheivable. Advancing guitarists will find they deepen their understanding of this rhythm guitar style and enhance their execution of it with additional techniques. Vocalists and other instrumentalists are encouraged to complete the class and project by playing along with one of the available backing tracks! 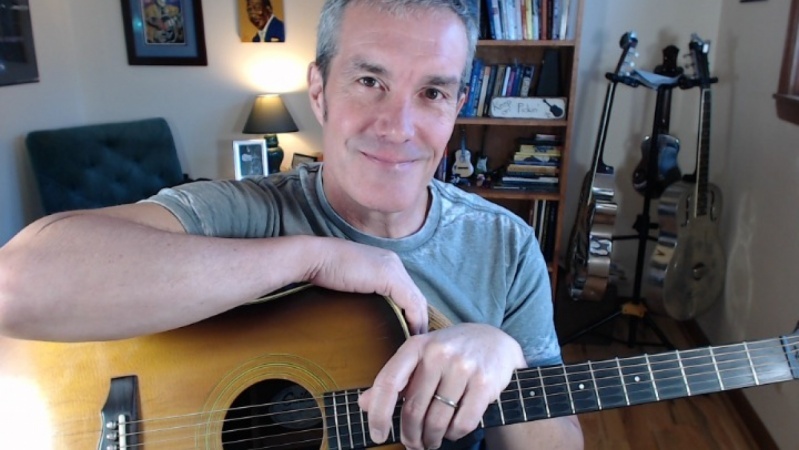 You'll also be able to share your performance vids and ask questons and get immediate feedback from your guide, Scott Perry - founder of GuidedGuitarLessons.com! Play a 12 Bar Blues Rock Shuffle In 6 Easy Steps!